If you’re looking for general information about the 24 hour time system, here’s a quick summary. Modern 24 hour analog clocks and watches, and many digital clocks and watches, use the 24 hour time system, in which the 24 hours of the day are numbered from 1 to 24, or 0 through 23. The first 12 hours of the day are numbered from 1 to 12, but 1 in the afternoon is numbered 13, 2 is numbered 14, and so on, until 11 at night, which is numbered 23. 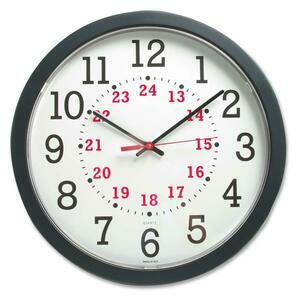 The 24 hour time system is also widely available as an option for digital clocks or watches. If they can’t manage the 24 hour time system, they’ll need some kind of AM/PM indication. Digital clocks don’t appear much on this site, since we’re interested in the analog dials, and there’s little of interest to say about digital clocks anyway (Douglas Adams summed it up nicely). To convert to 24 hour time, add 12 to a PM time. To convert a 24 hour time to 12 hour time, subtract 12 if it’s 13 or more, then add the right suffix (AM if the original value was less than 13, or PM if 13 or more). Here’s a short video I created which compares a 12 hour clock showing the 12 hour time system with a 24 hour clock showing the 24 hour time system. The 24 hour clock has also been called railway time (in Europe), continental time (in England), and military or (a long time ago) railroad time (in the US). By the way, it’s only in the US (where 5% of the world’s population live) that the 24 hour time system is called military time. Thomson and Thompson, the detectives in Hergé’s Destination Moon, made the classic mistake of using the 12 hour system and then forgetting the important difference between an AM time and a PM time. The Latin tags Ante Meridiem (before the middle of the day) and Post Meridiem (after), abbreviated to AM and PM, are required to indicate the difference between, say, 1:34 in the morning (01:34) and 1:34 in the afternoon (13:34). You don’t need to say AM and PM if you use the 24 hour time system. Many older 24 hour analog clocks and watches shown on this site don’t use the 24 hour system, preferring the double-XII system, which consists of two sets of 1 to 12, usually in Roman numerals, one for the night/morning, one for the afternoon/evening). More recent models usually use the 24 hour time system. For practical reasons, though, clocks can’t show both 00:00 and 24:00. Most 24 hour analog clocks have settled on showing 0 or 00 to start the day. A few show 24. I think this is because it emphasizes the type of clock you’re looking at. In the 12 hour time system, midnight is usually written as 12 AM, and midday (noon) as 12 PM. People find this confusing because 12 AM is before 1 AM yet after 11 PM – the sequence 11 PM – 12 AM – 1 AM confuses because the suffix changes an hour before the value switches back to 1. The period of time between 11 AM and 12 AM is either 11 or 13 hours, but not 1, which you might expect. It’s also confusing that “12 AM” appears to mean 12 hours before noon (“ante meridiem”) but “1 AM” means 1 hour after starting counting from midnight, before noon. where hh is the number of hours since midnight (0-24), and the seconds are optional. Time zones can also be added, but there is no provision for using the 12 hour clock. This format is useful for computer users: lists of dates and times are easy to sort into order of occurrence. For example, you can use a numerical version of the ISO date and time (eg 20050621102746 for 2005-06-21 10:27:46) as a timestamp for databases and spreadsheets, making searching and sorting easy and predictable. The 24 hour time system is used throughout the world whenever people want to specify the time precisely and unambiguously. Scientists, technologists, the military, and anyone involved with travel and international affairs use the 24 hour time system. It’s use is always advisable in any situation where an error caused by confusing or omitting the AM/PM suffixes would be more than just inconvenient. The BBC World Service broadcasting from London uses the 24 hour time system for its time checks: “it’s 22 hours in London”, “23 hours GMT”, “Midnight GMT”, “1 o’clock GMT”, “2 o’clock GMT”, and so on. In France and elsewhere in Europe, the 24 hour system is used more than the 12 hour system. These days, to say 13:00 (1PM), the French say “treize heures”, the Germans say “dreizehn uhr”. But in Spain they sometimes use an equivalent to AM/PM: “Son las cuarto menos cinco de la tarde” (it is five before four in the afternoon). In the US, as in England, the 24 hour time system (and the metric system) is less commonly used in informal situations. Presumably the main justification for this is that it provides a verbal way of indicating that a time before midday is using the 24 hour time system: “3 o’clock” is ambiguous for speakers who also use the 12 hour time system when they’re off duty, “3 hours” sounds like a duration rather than a moment in time, so “three hundred hours” is intended to mean 03:00. The “hundred” is actually another way of saying “:00”. Outside the military, this usage is not common – in fact, it’s most likely to be heard these days as a humorous Monty Python style allusion to the military stereotypes of bygone days. By the way, in English schools, children are still being taught this strange usage. The national curriculum teaches both the 12 hour and the 24 hour time system, and how to convert between the two. Unfortunately, the 24 hour analog clock has not yet been introduced into the classroom. Thanks for sharing this article, it’s really helped my children understand the 24 hour clock. I’m French, and I would like to know WHY we use 24 hour time system instead of 12. What is good and bad in each system ? It’s all in the History section of this site. The 24 hour system in unambiguous. In some situations – medical, military, scientific – that could be a serious advantage. I am not sure what you mean by do what works? I hope the yes means I can use it though, would be awesome. PS. sorry it took so long for me to respond, so gosh done busy with the book, kids and my regular job, I didnt check your response. Hi – yes I meant that you’re welcome to do anything with the movie. I can’t see how a movie works in a book but if you can get it working, go ahead! If there’s anything else you need, just ask. The main problem in using 24 hour time system is speaking the time in day to day life. It is no doubt that 24 hour time is unambiguous and explicit, but we hardly speak in 24 hour. Here in India [New Delhi] Railways time tables are printed in 24 hour, but people mostly use 12 hour time, they use it in cell phone settings, TV program listings in newspapers and live TV broadcastings, advertisements well every where. I think it is because everybody thinks 12 hour would be easily understandable. Although I have personally checked people understand 24 hour time but they don’t use it. Some of them said it requires a mental arithmetic for them but mostly we don’t use it because we don’t speak it and overwhelming majority uses analogue watches which are again in 12 hours only. So the question comes what do we do about it? But there’s no problem with having two or more systems: one for some situations, another for others. It’s like imperial and metric measurements such as inches and centimetres – you have to learn both, and learn to convert between the two, because we live in a complex world with different peoples, cultures and histories, and because there’s no one all-powerful authority enforcing uniformity. Languages change at their own speed, anyway, regardless of what people think is right or convenient. hi, I’m French and I don’t know how to say “00:10” in digital time. should i say : “24 ten ” ” 0 hours ten”…? I’m at a loss, could you help me ? Found this interesting thing on the net, non english speaker might able to tell more. It has been suggested that the 24-hour clock, when contrasted to the 12-hour clock, has certain psychological effects in how the dual-system mind interprets it in accordance to the environment. Mainly found in countries such as the United Kingdom where the two systems lie side-by-side, it has been suggested that reading a time such as 3pm seems earlier in the day than 15:00. The reason for this can be explained in the way the mind interprets time. Whereas 3pm seems to suggest that there is a significant amount of time following it, and is early in the afternoon, 15:00 suggests that it is heading towards the end of the day, therefore making it appear later. This effect can be better demonstrated by changing one’s own (digital) watch from 24-hour to 12-hour (or vice-versa) and interpreting the effects oneself. My holy grail is a 24 hour analog Atomic clock or watch. There are tons of clocks and watches that are synchronized by radio, but I have never found an analog 24 hr one. The closest I came was a 24hr dial option for a master clock system costing several thousand dollars. I had an old Franklin 24 hr clock in the 1970’s. Like most wall clocks made back then it was AC powered with a synchronous motor, so it kept excellent time. Unfortunately the case was damaged during a move. I wish I had known that the movement would become obsolete and unavailable, I would have kept it. Why is the day set at 24 hours? In the UK we’d probably say “5 minutes past midnight”. We use both systems interchangeably. Minutes are exactly the same . Only the hours are different. Nice info. It is an extraordinary thing, is it not, that although the first way man measured was a sundial. And a sundial basically is the equivalent of a 24 hour watch. So how did it come about that all of a sudden man switched to a 12 hour clock? There’s a big glycine airman with three dials (shown on the Design page), but you might also get suggestions from the watchuseek forum (second link in sidebar). I am personaly satisfied with all your explanations concerning 24 Abd 12 hours times.